Putting the customer first and shifting your perspective to seeing how your design might be viewed by others is really important in today’s globalised, competitive market. It’s Mark’s turn to tell a story this week and the example he tells is particularly useful if you’re designing products, processes or services. Doug Dietz works for years on a design for an MRI machine. He goes to see it on site and is shocked by what he sees. What he does next revolutionises the MRI experience for children. Lots of companies make ‘putting customers first’ in their strategy – this story is a perfect example of how to do that. Dietz has given a Tedx talk on this topic. If you’re interested, you can find it here. A few years ago. Industrial Designer called Doug Dietz working for GE Healthcare. Major role in designing new MRI machine. Took years. It was installed in hospital. He went there to see it in the hospital like a proud dad. Worked perfectly. Next patient to come in was a young girl. Crying, terrified. Her parents were encouraging her to be brave, soothing her. He looked again at the room and knelt down to the same height as the young girl. He viewed it very differently. Saw a big sign on the door saying ‘DANGER’. Black and red tape marked out pathways looked like an accident zone. Walls were painted beige/grey. Floor was concrete. It was dark, cold and forbidding. There was a constant hum in the room. For a seven-year-old it was terrifying. She got closer to the machine. She got more upset, they called a physician who sedated her. He went away and did some research. Eighty percent of kids were sedated before going into the machine. Customer experience feedback was very poor. He looked at it from a child’s perspective and decided to make it an adventure experience. They created adventures for the MRIs. New machine was designed to look like a canoe and the goal was to remain as still as possible so as to not fall into the water. Waterfall painted on the wall. Scents of lavender rather than disinfectant. Installed the machine in the hospital. In one hospital, the number of children sedated went down from 80% to less than 1%. Customer satisfaction went up by about 92%. Didn’t need extra doctors. Each patient got through faster. Welcome back to Anecdotally Speaking—a podcast to help you build your business story repertoire. Hi, I’m Shawn Callahan. I had an interesting insight last week, Mark. You were in New Zealand last week? I was in New Zealand. Like there was some blue sky? Don’t say that, New Zealand is a lovely place. I was flying over and a colleague of mine, Mike Adams, who’s in the process of finishing off a book he’s writing on storytelling and sales. And he’s been saying ‘come on I want you to read my book’. And I said, ‘O.K. when I fly over I’ll have a read’ and I’m so glad I did. I really enjoyed his take on storytelling. He’s been working in that space of helping sales people be better sales people for some time and he has some really interesting ideas. And one of them struck me. It was around this idea of connection stories. We’re obviously big proponents of this idea that it makes an enormous difference if you can share a story that helps people understand who you are and why you’re there. And why you do what you do; what makes you tick? Why do you care? All those things. And Mike, in his book, was saying that’s really important especially in a selling environment but what’s more important is for the person you’re talking to, to get them to share their story back. Reciprocity in your connection stories and when I thought about it, in those small meetings you might have with just a few people, it’s so important to do that because that’s when you start to realise that you’re quite like the other person. It always happens doesn’t it, you share a story and it reminds the person you’re chatting to of something that happened to them. They share a story back to you and that’s where the rapport starts to happen. When they share the story back it’s a strong indicator that you’ve established a connection. Exactly. Clearly, you can’t do this when you’re giving a presentation to 500 people. It could take a little while for everyone to share their stories. But in terms of those small group meetings it is absolutely perfect and a great idea; what a nice insight. With that in mind I don’t even have a really great way to segue but I’m going to say, ‘you have a story for us today’. Repertoire for their back pocket. So, give us the situation and lay it on us. Well, this is an example of how taking a customer perspective is really important and it’s a story from a few years ago. 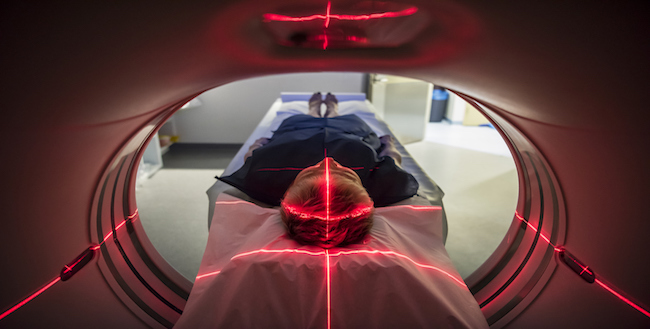 An industrial designer called Doug Dietz working for GE Healthcare; he had a major role in designing a new MRI machine (magnetic resonance imaging machine). They put years of work into designing this machine and he was really proud. And soon after it was installed in the hospital he went along kind of like a proud dad to see his machine. And he goes into the room and he’s looking at it from an engineer’s designer perspective and he’s seeing this amazing thing. The machine worked perfectly. It was doing exactly what it had been designed to do. From the design and engineering perspective it looked fabulous. But what he noticed was the next patient to come in; a little girl (7 years old). And she was terrified; tears streaming down her face, Mum and Dad beside her with that look on their faces ‘how are we going to get her through this?’, kneeling down and encouraging their daughter to be brave. And Doug knelt down to be the same height as the little girl to get her perspective of the room. And what he saw was a big sign on the door saying ‘danger, danger’ and all the black and red tape on the floor marking out the pathways—it looked like an accident zone. He noticed the walls were painted a beige/grey, the floor was bleached concrete, and it was dark and cold and forbidding looking. And of course, you’ve got the noise from the MRI machine. To the extent that you wear earplugs or earmuffs to deaden some of the noise. It’s quite a forbidding experience particularly for a 7-year old girl. She was terrified; she was crying. As she got closer to the machine she got even more upset to the point where they called for a physician to come and sedate her. They sedated her and she went through the experience. Doug was shocked. From his industrial engineering design perspective, he was going this looks fabulous. But he realised from a 7-year old customer’s perspective it looked terrifying. So, he decided to do something about it. Doug went and did a bit of research and he found out that many kids were sedated before going into the machine–in fact about 80%. Just crazy. The customer feedback was very poor and this had nothing to do with the design or function of the machine; it was just the customer experience. So, he decided to look at the design view from a child’s perspective and he realised it could go from being a terrifying medical procedure to an adventure. They created an adventure that would be appealing, that kids would want to go on and would reduce the fear they were feeling. I’m sure I’ve used that tactic, the adventure tactic; come on kids, we’re going on an adventure. It’s not a walk, it’s an adventure. When the kids are in the preparation room they’re told they’re going on an adventure, they’re told they’re going to get on a boat (it’ll be painted like a canoe) and be careful not to rock the boat, and there’s a waterfall painted on the wall. And they had scents; lavender rather than disinfectant. They made a whole bunch of important but subtle changes. Do you have to be a 7-year old to take advantage of this? I think I’d like to go on that experience. And so, they installed this redesigned machine and facility and an amazing thing happened. In one hospital the number of children who had to be sedated went down from 80% to less than 1%. I’m pretty sure they didn’t achieve the 1% in all places but a significant reduction. Customer satisfaction went up by about 92%. Imagine how low it must have been before. That’s an important lesson that Dietz took away from that. From a functional design perspective this machine was fantastic but it was the opposite from a user perspective. So, it’s always important to design things from a customer perspective. That’s fantastic. I love that. For some reason when you were talking about the canoe it reminded me of Knott’s Berry Farm, which is a place with canoe rides, some long rides but anyway that’s an aside. Well — canoes and water. That’s terrific. The things that’s jumping out for me there is that whole idea that as soon as you shift perspective all of a sudden a whole bunch of things can come to light for you. That designer had a real moment where he realised just how far off he was. It also highlights the importance of going out into the field. Exactly. Seeing how your products are actually used. It can all look very nice and shiny from the lab but it’s out in the real world. I wonder how many people don’t do that and miss out on the potential for incredible insights into how their ideas or even their processes are being experienced by the users. I saw an example of it, probably a couple of years ago, doing work for a university and speaking to a deputy Vice-Chancellor who was in charge of academic curriculum. And I asked her when was the last time she’d been down and had a look at a lecture. She had never seen a lecture. That’s not customer-centric at all is it? I had to hold back my incredulity. That’s the sort of crazy thing that happens. But let’s think about this story and why it works. I love it. It really grabs you. The fact that it has children and children suffering. We know from our hierarchy of stories that it’s right at the top there. Just under death it’s safety of children. That draws us in; we want kids to be safe, to be having a good time and certainly not going through that sort of pain that jumps out for me. What about you? One of the key points for me when I first heard that story was the fact that he knelt down to get the perspective of the little girl. So, I can picture that happening, moving from an adult perspective to a child perspective by the simple act of kneeling down. He was literally taking a customer perspective. I think too having the data, specific facts in there. One of the nice things is the contrast from 80% sedation to 1% and customer satisfaction went to over 90. Things like that especially when it’s such a big contrast it’s kind of shocking. You hear that and go ‘oh my god, that’s such a phenomenal change’. Also, the contrast between the engineer perspective and the user perspective. Exactly and humans love contrast. It’s the way in which we work out what we have to attend to. From an evolutionary perspective we are attuned to movement. Anytime we see movement, like the kneeling down, we’ve learnt over the millennia to quickly work out; moving things, are they dangerous or safe? Our eyes have evolved to be able to do that. It’s like those games in the newspaper where you have two similar scenes and you have to work out what’s different. It’s hard to do because the thing that’s different is not moving. It’d be a totally different thing if Wally was moving around. Where is he? Other things that work about that story; GE Healthcare, a big company, everyone’s heard of it so it’s relatable. Also, most people have been to a hospital either as a patient or a visitor. Very familiar with that feel of a hospital, maybe they’ve even had experience of an MRI. Exactly—that’s not an uncommon experience these days. People can imagine themselves in that situation so it’s relatable. I think there are some strong emotions in that story as well. Your heart goes out to them. Any person that has to get their kids to do something they don’t want to do especially when they’re scared like that, that’s tough for parents. You can feel that. There are some terrific elements to that story. Yeah, it’s got lots of things about it that work. So, how would we use that story in a business situation? The one that first jumps out for me is anytime you’re doing a design activity, a product, process or service; it’s about getting people to think from a user’s or customer’s perspective. And you could tell that story to show how easy it is to get it wrong especially if you’re working with a group of scientists or engineers and they want to get the system perfect. They’re building the next big machine; that would be a great one to tell just to get them to shift perspective. There have been several examples in the last few months where I’ve been involved with people who are designing processes. And it always scares that people design processes at their desk rather than going out there and experiencing the world as it is. I would use that story to encourage people to get out there and look at things from the user perspective, at the coal face, at the point of use because it might give tremendous insights into both how things should be designed and some of the traps and potential pitfalls that need to be avoided—the practicalities of the situation. I could see that would actually make a big difference. In terms of things that could be added to that story; if we knew the dollars involved, if you had a real hard-headed business user that you’re trying to persuade around the importance of adding the aesthetic, the beauty elements. We know it’s vitally important in great product design but sometimes they need to hear the advantages and value you actually bring when you do those sorts of things. And now that you mention that, in my reading-up around that story there was a whole bunch of additional benefits that came beyond customer satisfaction and the reduced need for children to be anaesthetized; advantages like they didn’t need extra doctors to do the sedation for kids—that’s an expensive thing. They could get people through the machine faster so there was high utilisation of the machine. So those sorts of things could be added into the story if you were discussing that story with someone who had a very strong economic rationalist view of what you’re proposing. I think you’re right. I think the other thing that is becoming a bit of a trend now like when we work with people telling the story of their strategy and the number of times we’ve seen the strategic choices being ‘putting your customer at the centre of everything you do’—you’d be doing well if you got a few dollars for each time you saw that, right? But this story is a good one to say this is what it looks like. I’m casting my mind back over the last couple of years. I can’t think of a single strategy I’ve seen that does not have customer centricity or some variant as one of the key elements of the strategy. But like when we were talking to Gerry Lynch, those companies should also be able to find their own customer centricity. It’s great to tell a GE story to get them going but they need to quickly find their own because I have to say I’m not 100% a believer in people just saying they have customer centricity. I’ve seen executives roll their eyes at the thought even though that’s the company strategy. It makes me feel there is some work to be done there. Yeah and action. That gives some pretty good ideas of ways to use that story. And one more that’s worth noting is anytime you want someone to think differently. Or even just to change their mind. And of course, you’d tell the story differently, from the perspective that Doug was really proud; it was a fantastic machine, the functional results were fantastic, everything was working fine. But there are times when you need to think differently because the customer experience is the opposite. Many times, you want people to get out of a rut and think differently and I think this story could be used in those circumstances as well. Fantastic. I think that pretty well wraps it up for us. Is there anything else we need to cover off before we finish up? I’d just remind everybody that if you liked the podcast please give us a rating on iTunes or whatever app you use. It just helps other people find the podcast and build everybody’s story repertoire. Thanks again for listening to Anecdotally Speaking. It’s great to have you along today. tune in next week and we’ll have yet another episode of how you put stories to work. Bye for now. I think you missed scoring this story! I give it a NINE (9).